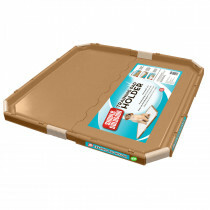 There are several options to consider when selecting a puppy training pads or pet potty pads. 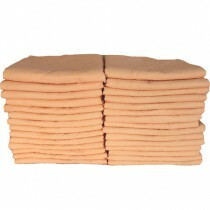 Some pads are more absorbent, some control odors more effectively and some provide a great value. Selecting one depends on how your pet will use the pad and how big they are. This guide will provide the basics for selecting the best pad for your and your pet's needs. Pet and dog potty pads are made up of several different materials that affect their absorbency. 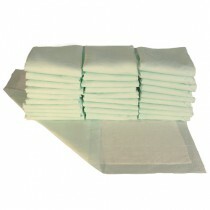 Basic pads are made from an absorbent fiber material. This can be made out of a variety of different materials but is typically made from a plant fiber which is then sealed between a polyester tear resistant tissue and a tear and leak resistant plastic bottom sheet. 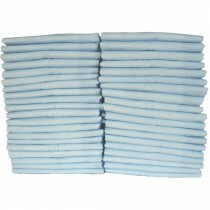 These pads absorb and store urine and other fluids quickly and are then held in place unless they become oversaturated. 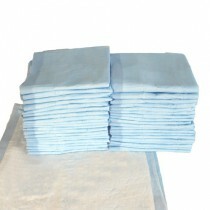 The pads dry by evaporation and can even be used multiple times for smaller pets. More absorbent pads are typically made from a combination of fiber, like in other pads, but also have absorbent polymer mixed in. The fiber is usually highly absorbent and can absorb up to 50 times its weight when absorbing urine. The polymer takes the form of tiny plastic beads which are screened to perfectly mix with the fiber fill. When combined with a filler, like fiber, the pad is capable of absorbing liquids quickly and then locking it in place with the polymer. The absorbent polymer changes the chemical makeup of whatever liquid is being absorbed. It will neutralize the pH of the urine to inhibit the growth of bacteria as well as eliminate the smell of both bacteria and the urine. 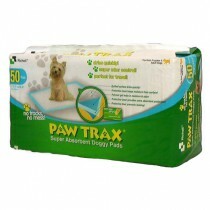 Pads made with fiber alone are perfect for smaller pets that do not produce a significant amount of urine. Small quantities will still absorb and dry quickly to stop tracking. Pads embedded with polymer are good for larger pets but can also be used for your smaller pets. They will lock in moisture for a longer period of time before evaporating but they will also hold significantly more fluid. 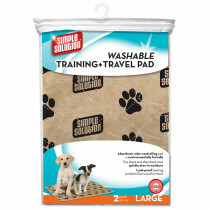 Sometimes our pets need an attractant to encourage your dog to use his/her pad. 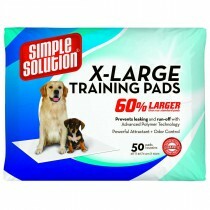 With some pets this can be a necessary step while others take to using pads naturally. 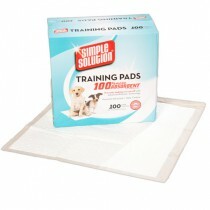 Some pet pads have attractants built into them which can be useful if you know your pet will need them. If you don't think you need the attractants, or want to try without them, we have a variety of pads available without them. If your pet is having trouble using them and you think you'll need attractant you can buy some separately from the pads to apply later. House training your puppy requires you to shape your pet's behavior. The first step in this is to know your pet's needs. Are they a large or small breed? Lager breeds can have a slower metabolism and larger bladder which may mean they need to relieve themselves less frequently. Your pet's living conditions also make a difference. If you live in a high-rise apartment and can't take your pet out early in the morning you may need a pad for them to use in the mornings. Small pets can have a high metabolism and a small bladder which means they may need to relieve themselves more frequently. If your pet is already used to one method of relieving himself then you will need to re-train your pet's behavior patterns. Many experts argue that the best time to start training your puppy is when they are between twelve and sixteen weeks old. Using reward based training system will help train your pet even more quickly. For example, whenever your pet uses their pad or relieves themselves outside, giving them a reward can help to reinforce the behavior. However you set up your schedule or your living space keep two rules in mind while training your pet. Keep the routine consistent and provide positive reinforcement. Letting your pet know they are doing well and rewarding them is a much more effective way to train than punishing them when they do poorly. Sometimes pads are a great option for other pets. If you have a cat or kitten that has trouble using a litter box a pad could help them to consistently relieve themselves in the same place. Smaller pets like birds and bunnies can also use pads to easily clean their cages while providing extra absorption and protection of their living space.